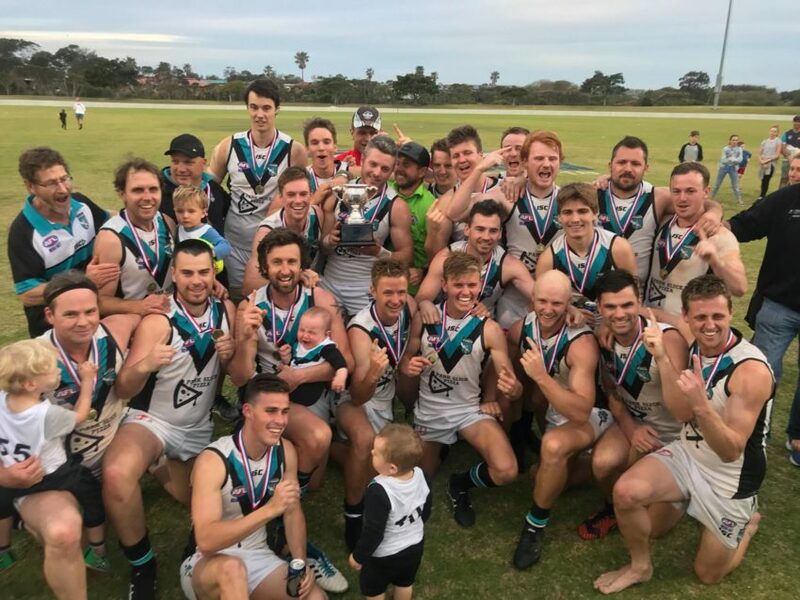 Saturday saw the culmination of the 2018 AFL South Coast season as Premiers were crowned in the four senior competitions at North Dalton Park. In the main game of the day the Men’s Division One, Kiama Power put years of heartache behind them as they claimed their first senior premiership since 2011 with a 13-point victory over last year’s premiers Wollongong Lions. 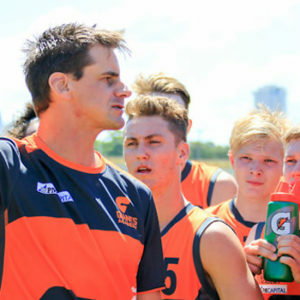 Kiama entered the match as warm favourites after losing just the one game throughout the year (to the Lions in April) however had to dig deep after the Lions came out firing to kick three goals to nil in the opening term. With the wind behind the Lions, the margin could have been greater however the Lions were inaccurate in front of goal registering five behinds. 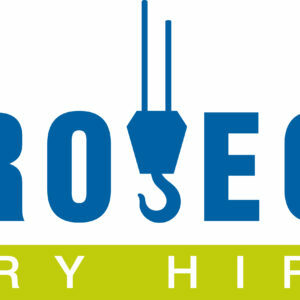 Despite being held goalless in the opening term, Kiama settled into their work in the second quarter and a trademark snap from key forward Troy Cole got the Power rolling as they slowly clawed back the margin to just four points at the main break by kicking four goals to the Lions one. Kiama took control of the match in the second half as their outside run and clean ball use clicked into gear to take the lead however the Lions refused to go away. The eight-point deficit at the three-quarter time break would not have been a worry for the Lions however as thoughts wandered back to the 2017 decider where they trailed by 12 points at the last break only to storm home to victory. There would be no repeat of 2017 however as Kiama held their nerve in the final term to hold on for a deserved victory and much relief from the Kiama players, coaches and supporters who had been so close in the past 7 years without tasting victory. Kiama’s Jack Mahony was adjudged Best on Ground thanks to his tireless work in the middle of the ground however it was a very even performance from the Power side who all stepped up to the big occasion. Strong contributions came also from Scott Phillips, Stuart Brierty, Ben Hoctor and Charlie Wood while clutch goals from Josh Krull proved pivotal. 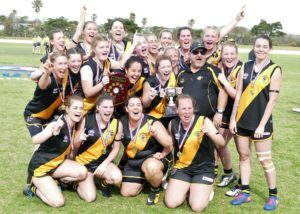 Prior to Kiama’s Division One victory however it was all Bomaderry Tigers as the club claimed an historic hattrick by winning the inaugural Women’s competition to go with the Men’s Division Two and Three flags. 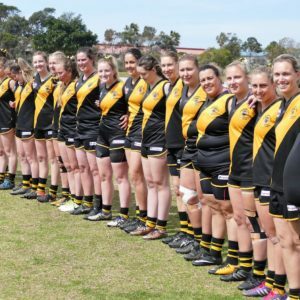 The inaugural AFLSCW premiership was in the balance right up until the final siren as minor premiers Bomaderry Tigers turned the table on the Wollongong Lions from the Major Semi to claim a 2-point victory and claim a slice of history for not only the womens team but also the club. Bomaderry led all day however the final quarter they were kept scoreless and were required to defend for their lives as the Lions did all the attacking inside their 50 however could only register the single goal. Maddy Collier medallist Sophie Phillips completed the perfect season after being announced as Best on Ground to go with the Premiership and League Best & fairest Medal. 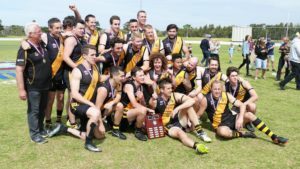 Bomaderry Tigers capped off their day by winning both the Division Two and Three flags up for grabs. In Division Two the Tigers were pushed the whole way by a determined Kiama outfit. 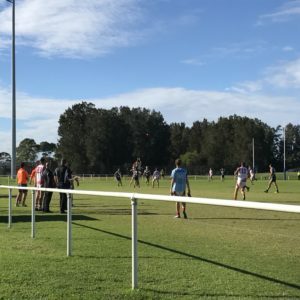 Bomaderry were wayward in front of goal which kept the Power in the game and at the final break a huge upset was brewing however Bomaderry held their nerve in final quarter to come away 12-point winners. Jack Boxsell was adjudged Best on Ground while three goals to Matt Polman proved vital. The Division Three decider was a thriller as Figtree outplayed the Tigers for the first three quarters however Bomaderry came from 10 points down at the final break to claim victory when Jeremy Owens kicked a goal with just minutes left and they were never headed.